On Thursday the wild, stormy winter weather eased and we had a day of overcast skies, little rain and no wind. So I loaded the large format cameras into the Subaru Outback and took off for a day trip the Mallee along the Mallee Highway. I needed to continue to photograph the silos with the 8x10 Cambo for the forthcoming Weltraum exhibition in the Shimmer Photographic Biennnale. I photographed at Peake and Lameroo. The silo at Geranium was difficult and I left it for another occasion. I didn't make it to the Victorian Mallee as 220 kilometres one way was far enough for a day trip. Maleko accompanied me on the day trip. It was his first time on a photo trip. 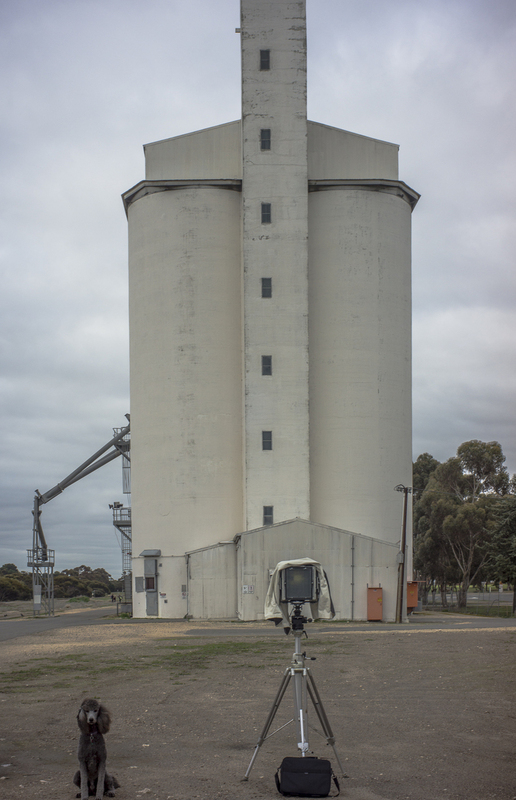 After I finished the silo photoshoot in Lameroo I briefly photographed around the town. I struck up a conversation with a wool buyer who had seen me photographing the silos about the history of the Murray Mallee. He informed me that the last train on the Mallee Highway railway line had been around October 2015, and that the silos along the Mallee Highway now stand empty. The wheat is now picked at the farm gate up by trucks and then taken by road to either Pinnaroo or Tailem Bend. That is is the end of an era that began with the vegetation clearance, agricultural development, small farms and the railway infrastructure in the early 20th century.